Bangalore: A device that would help people suffering from night blindness and blindness due to old age regain vision will go into clinical trial in India by the end of next year. US-based Doheny Eye Institute has partnered Bangalore’s speciality eye hospital Narayana Nethralaya to conduct the so-called second-phase trials of the device and also work on bringing down its cost to less than $10,000, said an official. Doheny is working with Second Sight Medical Products Inc. to build the 5mm device that uses a semiconductor chip of Texas Instruments Inc. and is powered by a battery pack worn by the user. The device, called the Bionic Vision, consists of a tiny camera and transmitter mounted on eyeglasses, a receiver implanted in the eye and an electrode-studded chip secured to the retina. Each device, made of inert metals such as platinum and gold, currently costs $50,000 in trials, which would be brought down to around $10,000 each once it is launched commercially in two years. “There are people (even in India) who can afford such devices. 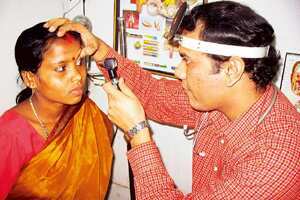 We will work on bringing down cost, but not build a low-tech device," said Rajani Battu, consultant, vitreoretinal services, Narayana Nethralaya.